Home NEWS Leaders defend electoral amendments, ask their supporters to vote Uhuru. Leaders defend electoral amendments, ask their supporters to vote Uhuru. Thika Town MP Eng. 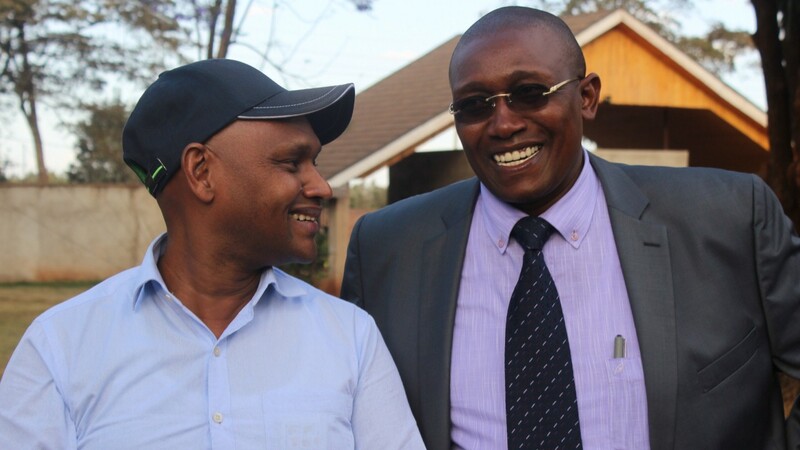 Patrick Wainaina and Kiambu County Chief Minister Bishop David Kariuki Ngari having a light moment out the governor's office in Kiambu Town after the leaders meet to deliberate on the ongoing presidential campaigns. Thika Town MP Eng. Patrick Wainaina Wa Jungle has defended the amendments to election laws saying the Kenyan Parliament will not be deterred by calls from the foreign envoys but will instead proceed with the mandate given to them by the electorate. Speaking after a meeting with all Kiambu leaders at the governor’s office in Kiambu Town on Tuesday, Wainaina argued that the legislation was legitimate and aimed at streamlining the election process by removing any grey areas in the existing Act. He added that the diplomats were in no position to dictate to Kenyans arguing that it was their prerogative as the people’s representatives to seek and implement changes they deemed fit for the country. “Foreign diplomats have no right to demand us from executing our duty to legislate as this was one of the prime functions I was voted to Parliament. The amendments are in the best interest of the country as they will help us seal the gaps identified in the hearing of the NASA petition at the Supreme Court and ensure the voter is protected and the process is made more transparent,” said Eng. Wainaina. He dismissed claims by the opposition that Jubilee Party’s move was unconstitutional arguing that everything had been executed in accordance with the Standing Orders of Parliament. He blamed the opposition for dragging the country backwards through endless hurdles that cost Kenya to lose economically. “This political noise and the prolonged political wrangles are not helping the country. The on-going protests led by the opposition have played a key role in destabilising the economy with the tourism industry being among the worst-performing sectors,” said the Thika MP. In connection to the on-going presidential campaigns, the MP pointed out that Kiambu Governor Ferdinand Waititu met all county MPs in his office to schedule the programme that would see them transverse the whole county to mobilise people to vote for President Uhuru Kenyatta on October 26. He said that their key mission was to target all those who failed to vote during the August polls to ensure that, this time round, they exercised their mandate as electorates and confirmed Uhuru Kenyatta as the President of Kenya. “If I can talk about my constituency, we have been able to identify the locations of about 10,000 out of the 30,000 voters who did not vote in August and we will go out of our way to get the rest to ensure our president wins this polls with more than 3 million votes. We will also make arrangements to transport all potential voters to their polling stations, especially those unable to reach these stations for one reason or another,” he explained. The Kiambu campaigns will kick off this Thursday in Kiambu Constituency and will be followed by a mega prayer rally at the Thika Sub-County Stadium on Sunday that will be attended by all the county elected leaders. The prayer rally will be administered by Kiambu County Government Chief Minister Bishop Rev. David Kariuki Ngari alias Gakuyo. The bishop called on all residents to join them in prayer to pray for the country and ensure that the president won the polls with a landslide. He defended his position to support President Kenyatta by saying that other than being in the clergy, he was a Kenyan and had constitutional rights to support a candidate of his choice. “I know that so many people are saying that the clergy have taken sides but they are forgetting that we are also Kenyans and have a right to support candidates of our choice. Personally I have no problem with religious leaders supporting NASA leader Raila Odinga as they too have a right to decide which side to support,” said Gakuyo.